Over the last year, I noted down the times of every of our workgroup seminar. Well, not for every seminar but for 26. Our seminar is meant to be once a week. We talk about general things (instruments, conferences, publications, …) as well as individual projects (everyone in the group should give some information about the progress/problems/issues of his/her project). During the semester we also have a presentation from someone of the group (about 20 minutes). 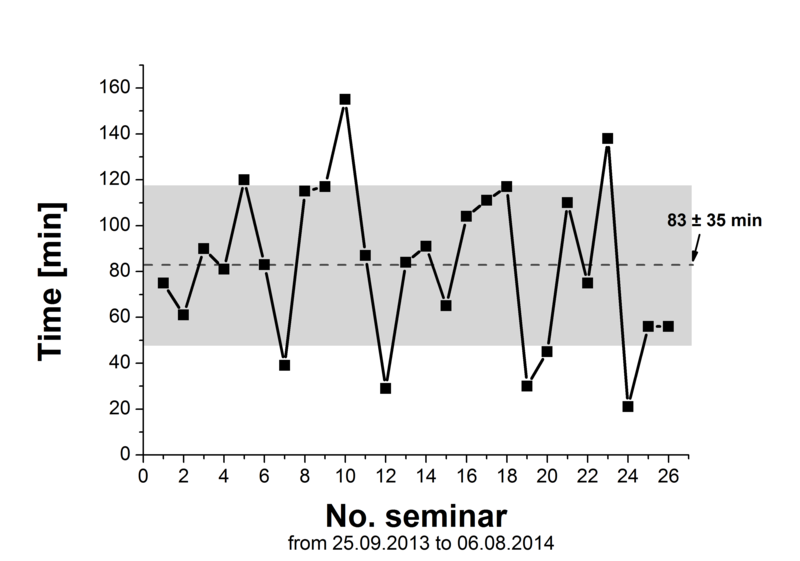 Time spent in 26 workgroup seminars over the last year (from 25th of September to 6th of August). I wonder. 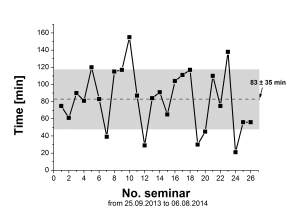 Is 83 ± 35 min a lot of time for a workgroup seminar for about 10 people? This entry was posted in Analytical chemistry, General and tagged Academics, Workgroup on 12. August 2014 by Sven Kochmann. The "chemical free" view of the world has the virtue of simplicity (and indeed, sees simplicity as a virtue itself). Want to stay healthy? Simple. Don’t eat things with chemicals in them. Want to know if something is the right thing to eat, drink, wear, etc.? Simple: is it natural or not? This is another thing that makes some people who argue for this view so vehement – it’s not hard, it’s right in front of you, and why can’t you see the right way of living when it’s so, so. . .simple? Arguing against that, from a scientific point of view, puts a person at several disadvantages. You necessarily have to come in with all these complications and qualifying statements, trying to show how things are actually different than they look. So there are plenty of reasons why it’s hard to effectively argue against the all-natural chemical-free worldview. You’re asking your audience to accept a number of things that don’t make much sense to them, and what’s worse, many of these things look like rhetorical tricks at best and active (even actively evil) attempts to mislead them at worst. And all in the service of something that many of them are predisposed to regard as suspicious even from the start. It’s uphill all the way. Mmh. Sadly, this is true. I had so many debates and arguments about these things with non–chemistry people (including relatives). After, I really feel exhausted because it feels like breaking through a brick–wall of ‘simplicity’. I remember a talk I gave in a circle of physicists about my diploma thesis ‘Optical pH Sensors for Dermatology’. After the talk there was a short discussion. The very first question was ‘Will your stuff harm or kill you?’. Sigh. Now, instead of arguing, I suggest eating amanita verna or the like. It is all natural and, therefore, chemical free, isn’t it? This entry was posted in Analytical chemistry, General, Outside of the box and tagged outside the box, Public on 3. July 2014 by Sven Kochmann. Three weeks ago my colleague and me conducted oral exams of student teachers (in chemistry). One of the tasks given to the students by me was calculating of the molar concentration for a concentrated solution of hydrochloric acid (36%) or sulfuric acid (about 100%), respectively. This entry was posted in Analytical chemistry, Math and tagged HowTo, Introduction, Math on 16. June 2014 by Sven Kochmann. Todays detection limits are very low. Using various methods such as amperometric detection , surface plasmon resonance , and laser–induced fluorescence detection  it is possible to sense few attomolar (10-18 mol·L-1) concentrations of analytes. This entry was posted in Analytical chemistry, Analytical trap, Publications and tagged Peer-review, Publications, trap on 30. April 2014 by Sven Kochmann. 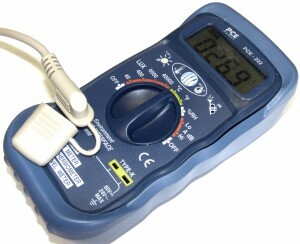 ICP-OES: Why spectral lines are true peaks and how this can fool the user. 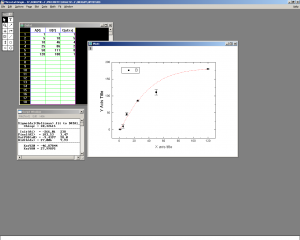 ICP–OES is a common technique in analytical chemistry, which is characterized by simplicity, simultaneous multi-elemental determination capability, high sensitivity, linear dynamic range, low detection limits, and good precision . 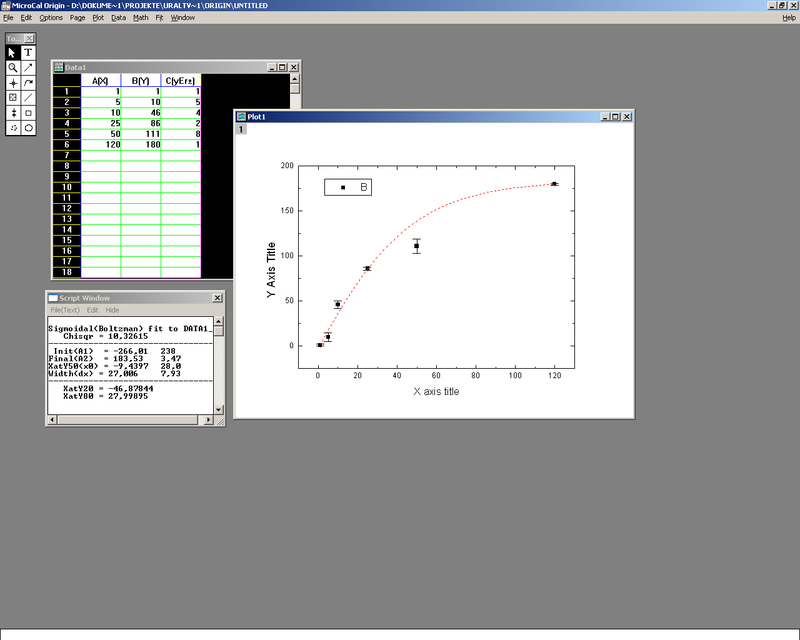 It seems to be the perfect method for element analysis (esp. metals). However, sometimes it can fool the user. This entry was posted in Analytical chemistry, Analytical trap, Instruments and tagged Advanced, ICP-OES, instrument, trap on 24. March 2014 by Sven Kochmann.